The performance Er-schöpfen was realised in 2004 and had an duration of 4 hours. 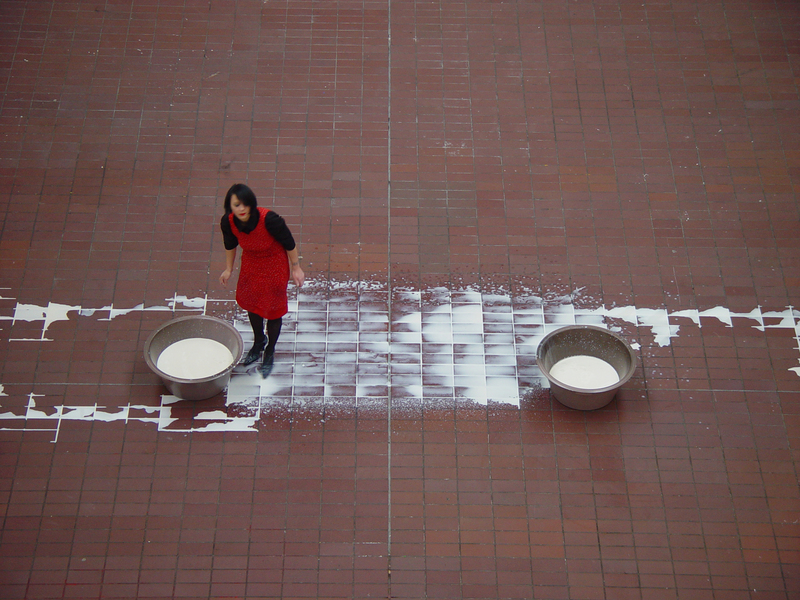 The artist scooped 50 litre milk from one bucket to another. Katharina D. Martin’s works are touching in their loneliness. Separation seems to be the main theme there – a lonely female figure, abstracted from wider context although always closely connected to the architectural space, both enclosed and defining it. It is the loneliness that outlines the vulnerability of the artist in her performance more than nakedness or self-violence, often used by women performance artists. [...] The Artist’s curriculum vitae, as presented by her, reveals enormous amount of pain and traumatic moments of loss and mourning. The feeling of loss is prevalent here – in the face of it, people find themselves alone on every level: spatial, temporal, institutional, affective. As pain does not produce a homogeneous group of bodies who are together in their pain, the artist’s works reveal the particularity of painful experience and, through their intimacy and quietness, fight against universalization, and therefore a commodification, of it. Methodological rhythm, repetition of gesture seems to be another connecting element, be it the needlework, the painstaking sweeps of the brush, the tearing of endless layers of paper, the reddening of the face with a lipstick. Slowing down, suspension, and eventually timelessness are evoked, despite clear time frames of the performances. This repetition can be seen as a healing process, but is in itself monotonous and unnerving, at moments verging on the trance-like. Repetitive structure of Martin’s performances, where difference is artificially re-created by means of the repetition of quasi-identical movements, has important functions through its tendency towards differentiation, distinction and multiplicity. It inaugurates a play of substitutions, classifications, reversals and absence and presence, helping to defer closure in a work of art by establishing expectations of recurrence. Although without a voice or music, the sounds mirror the repeated gestures, becoming increasingly obtrusive. The artist is very conscious of that repetition, and extends it on the institutional level: her performance The seamstress, 2006 was performed over a month, 2 days each week at fixed hours. That episodic structure and resemblance in Martin’s works produces psychic assurance and a sense of coherence, even if repetition is variable and irregular; it includes difference within itself. The connection between repetition and trauma, loss and pain has a long tradition. The structure of trauma, apart from freezing into silence, may initiate a compulsion to repeat. The function of repetition, understood by Freud, is to repeat a traumatic event (in actions, in dreams, in images) in order to integrate it into a symbolic order, to allow one to experience for the first time the traumatic event that had not been truly experienced because there was no language available to express it directly. Repetition is refusing and guarding off the pain and loss and simultaneously opening to it. Repetition constitutes here the balancing act between absence and presence of the subject that has gone through painful experiences and fears more pain to come. The subject is already gone and at the same time instantly memorialized. Ph.D., Utrecht University, Lecturer at University of Texas at Austin.